It is used by almost a tenth of the world’s population. It gives people a buzz equivalent to six cups of coffee and is used variously as a symbol of love, marriage and a cure for indigestion and impotence. Now in Taiwan, where the nuts are affectionately known as ‘Taiwan’s chewing gum’, the government is taking action to curb this centuries-old habit and reduce the thousands of lives lost each year. Although the exact preparation varies across countries and cultures, the quid is usually a mixture of slaked lime, a betel leaf and flavourings such as cardamom, cinnamon and tobacco. “About half of the men here still don’t know that betel nuts can cause oral cancer,” says Prof Hahn Liang-jiunn, an oral cancer specialist at the National Taiwan University Hospital. Like most people, Qiu Zhen-huang, 54, was completely unaware of the risks. A former gravel company worker, he chewed for ten years. Twenty years after quitting, he developed the disease. “I started chewing betel nut because everyone at work did it,” says Mr Qiu. Three years ago, a small hole developed in his left cheek and in just three months, the tumour grew to the size of a golf ball and completely changed his life. “Whatever I ate flowed out. I had a gauze pad over it. It hurt,” he said. Each year, 5,400 Taiwanese men like Mr Qiu are diagnosed with oral cancer or pre-cancerous lesions and an estimated 80 to 90% of those also chew betel nuts. An early symptom includes white or red lesions inside the mouth, but this can rapidly progress to grotesque flesh-eating tumours. Unlike other cancers, these are difficult to hide, leaving sufferers physically and psychologically devastated. “It’s miserable for them,” says Prof Hahn. Luckily for Qiu Zhen-huang, his cancer was treated and his cheek reconstructed. But the Taiwanese government is helping people detect the disease much sooner by providing around one million free screenings and funding programs to help people quit betel nuts for good. In 2013, these measures helped cut the usage rate among men by nearly half. 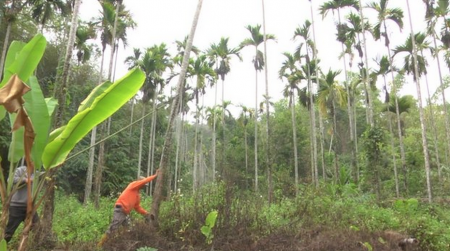 The government is also trying to reduce the domestic supply of betel nuts by offering subsidies to farmers to cut down their trees and plant alternative crops. 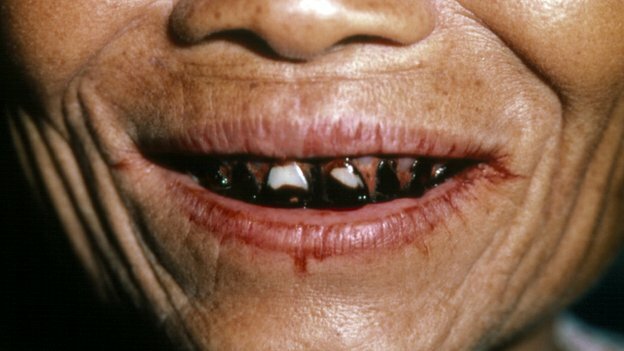 Other countries such as India and Thailand have also launched campaigns to discourage betel nut chewing. But there is still a way to go. At a recent presentation to elementary school children of fishing industry workers, nearly all raised their hands when asked whether their parents or relatives chewed betel nuts. And as the cancer can take up to 20 years to appear, the current changes will have come too late for many people – a fact that Mr Qiu keeps close to his heart.